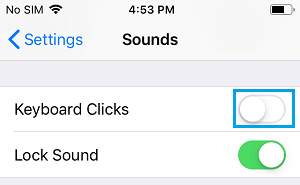 In case you want to, it is possible to prevent iPhone from making those clicking sounds when you type something using the onscreen Keyboard on your iPhone. You will find below the steps to Turn OFF Keyboard Click Sounds on iPhone. As you must have noticed, iPhone makes those clicking sounds whenever you type a text anything on your iPhone using its virtual or onscreen Keyboard. The clicking feature in virtual keyboards is designed to provide an experience similar to typing on a real keyboard. However, there are certain places and occasions where it is not appropriate to allow your iPhone to make those clicking sounds. For example, if you are in a library or classroom, the Keyboard clicking sounds coming from your iPhone may distract others or attract the attention of your professor. Hence, we are providing below the steps to Turn OFF Keyboard Click Sounds on iPhone, so that you can use your iPhone without distracting others. 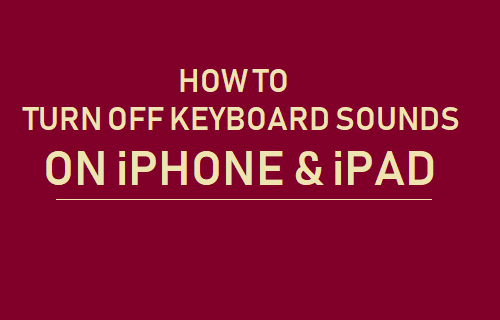 Follow the steps below to Turn OFF Keyboard Sounds on iPhone or iPad. 2. On the Settings screen, scroll down and tap on Sounds. 3. On the Sounds screen, scroll down and Toggle OFF the option for Keyboard Clicks. After this the Keyboard on your iPhone will no longer make clicking or other sounds, allowing you type in silence. 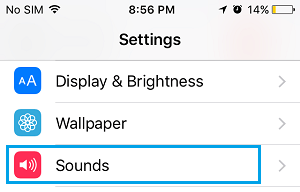 If you do not want your iPhone to make sounds while it is being Locked or Unlocked, you can also disable the Lock Sound option (See above image).